In October 2013, Liberty University became one of the nation's campus locations that offers VetSuccess on Campus (VSOC). 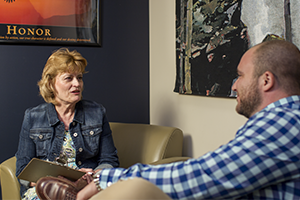 The VetSuccess on Campus (VSOC) program is a collaborative effort between Liberty University and the U.S. Department of Veterans Affairs (VA) with the purpose of easing Veterans' transition to student life and helping them achieve their educational and career goals. VetSuccess on Campus services at Liberty are provided for Veterans, service members, and their qualified dependents who are eligible for, or are receiving, any VA Education Service benefit. Vocational exploration and assistance in selecting a major/career compatible with your interests, aptitudes, and abilities. Information on other VA benefits to include disability compensation, life insurance, Home Loan Guarantee, and Vocational Rehabilitation & Employment. Referrals to on-campus, community, and VA resources to promote academic success. For more information, assistance, or to schedule an appointment, contact Millie Hall, our VetSuccess Counselor. Millie is a Certified Vocational Rehabilitation Counselor with sixteen years of experience in vocational rehabilitation. She has an undergraduate degree in Social Work from Averett University and a graduate degree in Rehabilitation Counseling from Virginia Commonwealth University. 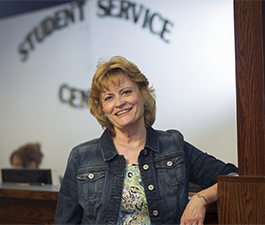 She is excited to be on campus and is ready to be of service to our Veteran and service member students.